Emma Greene enjoys living in rural solitude with her husband and five-year-old daughter, Maggie, far away from her college students in Jackson, Virginia. But late one night, with her husband away and her daughter upstairs in bed, some of Emma’s students trespass on her property. The ensuing confrontation changes Emma and Maggie’s life forever. Nine years later, still plagued by nightmares from that evening, Maggie is living with her father in the same small town, and entering her first year of high school. She develops problems in class when her math teacher, a strange and lonely woman, begins to exhibit an odd interest in her. I was very impressed with author Laura Brodie's last two books THE WIDOW'S SEASON and LOVE IN A TIME OF HOMESCHOOLING (you can read my reviews here and here), so when the author asked me if I were interested in reviewing her latest novel ALL THE TRUTH, I jumped at the chance! Ms. Brodie warned me that this book was very different from the other two that I've read; however, based on the description, I thought it sounded fantastic. And quite honestly, ALL THE TRUTH was more like my usual reading fare than her last two books, so I had a feeling that I'd enjoy it. 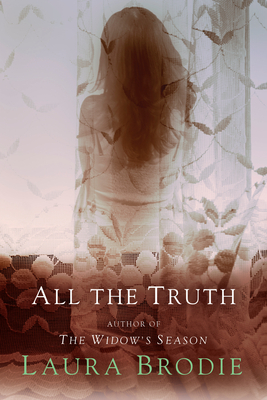 ALL THE TRUTH is a novel which shows how much a single event (more like a few minutes) can hugely affect lives. Emma, a college professor, lives a rather peaceful existence in rural Virginia. One evening while she is home along with her young daughter Maggie, she sees some of her students who have been partying nearby. When they show up at her house, Emma feels threatened so she confronts one of the guys. The exchange gets heated and Emma ends up reacting in a way that will forever change her life.. along with her daughter's and her husband's. The story moves ahead nine years when Maggie is a freshman in high school. She is still living with her father -- in a new house but the same small town. Maggie is still experiencing nightmares about her mother's actions; and despite getting therapy, she can't seem to really get past that night. When Maggie's new math teacher takes an unusual interest in her, she begins to suspect the real identity of the woman; and this knowledge has devastating effects on Maggie. To fully heal from the events that occurred nine years earlier, Maggie has to come to terms with the truth of her mother's behavior. I don't know if you noticed, but my summary of the novel is rather cryptic. That's because I was so afraid that I'd spoil the story! ALL THE TRUTH has a quite a few surprises for the reader, and I believe they are best left to be discovered by the reader. Having said that, it does make writing this review a bit challenging. Overall, I really enjoyed ALL THE TRUTH and I was once again impressed with Ms. Brodie's writing skills. The story definitely held my interest, especially since there were some surprising twists; and the characters were well developed and very real. However, I think what I enjoyed most about this novel was that it addressed some sensitive issues and made me think. One thing that I enjoyed about this novel was the setting -- a small college town in Virginia. I thought Ms. Brodie did an excellent job of bringing that atmosphere to life, and I especially liked how she showed the administrators' reactions to what happened that one night (hint: they had to protect the school and students!) Ms. Brodie actually teaches at a college in a small Virginia town, and it was evident that she captured not only what the college and town were like but also the political environment of the school. In addition, I really appreciated how this novel delved into some women's issues, namely double standards. Based on how Emma was treated, I had to wonder if there was a bias towards her because she was a female teacher who had taught some "controversial" issues in the past. Furthermore, I definitely had some doubts about whether her actions would have been judged so harshly if she were a man instead of a woman! And finally, I really enjoyed both the characters of Maggie and Grace. Maggie was such a wonderful teen and I really felt as if I got to understand her by the end of the novel. Naturally, my heart broke for her because she was such an innocent victim of... well, everything. However, I also appreciated seeing how she eventually became stronger and more able to cope with these events. And then there was Grace -- I found her to be incredibly interesting. Without giving too much away, her character brought to light many questions for me about guilt, personal responsibility, second chances, and redemption. I found Grace to be incredibly complex and I have to admit that I wasn't always sure how I felt about her. ALL THE TRUTH would, without a doubt, make a great pick for your next book club. I wasn't able to find a link to the discussion guide on-line, but there is one included in the back of the book with twelve interesting questions. Of course, you could probably discuss the motivations of the characters for quite some time; however, there are some other themes that you might want to explore including instincts, honesty, guilt, fear, loss, healing, fresh starts, and redemption. I most definitely recommend ALL THE TRUTH to fans of women's fiction. As you can see, this book touches upon some very serious topics and I have a feeling that almost every reader will take away some different from this novel. Wow, I'm very curious about what Emma did and what happened to her since you mentioned that Maggie lived with her father later. This sounds fantastic! I also have this one to review. I can't wait to get into this one on my vacation! I thought this one was excellent, too - and brought up so many issues that would make for great discussion points. She has yet to disappoint me with her books - can't wait to see what she writes next! You got me hooked.... I want to find out what happened that night. This is going on my list! I have this one to read, too, and I can't wait. Glad you really enjoyed it.